The Cascadia Bioregion is also referred to as the Pacific Northwest Bioregion and encompasses all of Washington, and portions of Oregon, Idaho, California, Nevada, Wyoming, Montana, Alaska, Yukon, and British Columbia. 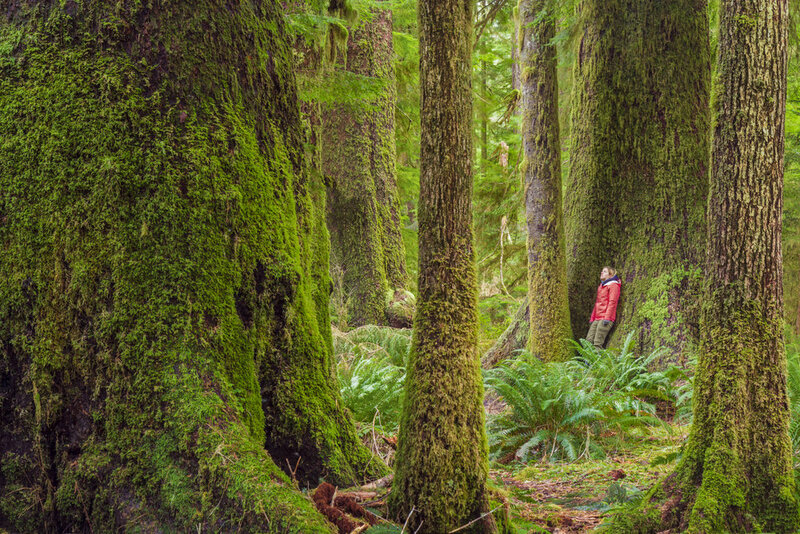 This is the land of old-growth forest superlatives. The enormous, ancient trees that live here are among the tallest, widest, oldest, and most massive in the world with individual lifespans reaching 500 to 2,000 years. Cascadia’s forests have more than twice the volume of biomass per unit of area as the world’s tropical rainforests and support huge varieties of mosses lichens, ferns, and shrubs in addition to countless mammals, birds, and insects. 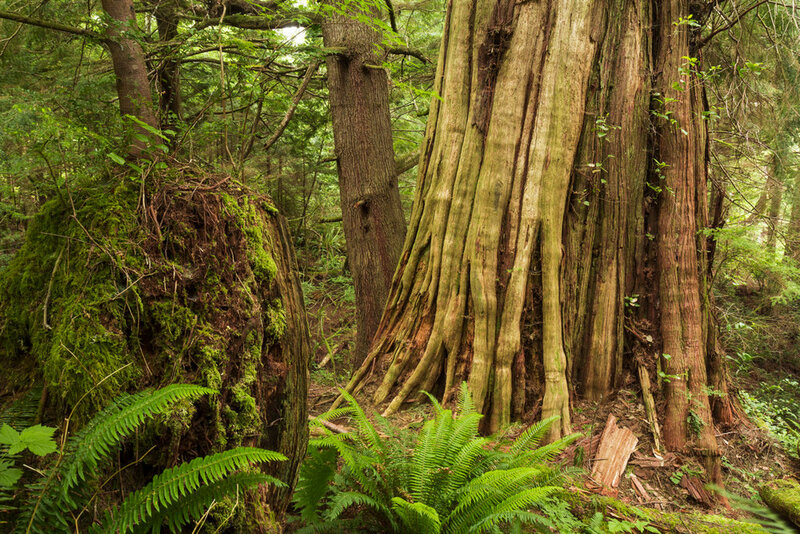 This guide focuses on the specific forested regions within Cascadia with the largest and oldest trees - western Washington (particularly the Olympic Peninsula), southwest British Columbia and Vancouver Island, California’s redwood forests, and western Oregon. For the most part, the following reports highlights the five giant tree species of the region: coastal redwood, western red cedar, Douglas fir, Sikta spruce, and western hemlock. The redwoods that grow at Cascadia’s southern end receive enough precipitation to shatter height, girth, and volume records. Similarly, western red cedars can grow to absolutely gigantic proportions, particularly in the wet climates of the Olympic Peninsula and Vancouver Island. Sitka spruces are generally found near coastal regions and are sometimes completely enveloped by moss, giving them an incredible primordial look. The great Douglas fir tree may not be as large as the others but it can grow to towering heights that rival the redwoods. This fir’s prominence in Pacific Northwest folklore has made it the symbol of the unofficial flag of the Cascadia bioregion. Lower Mainland encompasses greater Vancouver and several wilderness areas to the east. Its largest trees typically grow at the foothills of the mountains that extend south into Washington’s Cascade Range. Several trails in Chilliwack Lake Provincial Park and Skagit Valley Provincial Park allow backpackers access into British Columbia’s best forest hikes. The redwoods here are strictly protected in a complex of parks together named Redwood National and State Parks. Spanning both Del Norte County and Humboldt County, these parks include Redwood National Park and three California state parks : Jedediah Smith Redwoods, Del Norte Coast Redwoods, and Prairie Creek Redwoods. Humboldt Redwoods State Park , a nearby sister park just beyond Cascadia’s southern border, also shares a similar climates and supersized trees as the parks found in Cascadia proper. Inland, several federally protected wilderness areas, including Willamette National Forest and Umpqua National Forest offer hikers access to remote valleys and hikes with amazingly beautiful old-growth scenery.